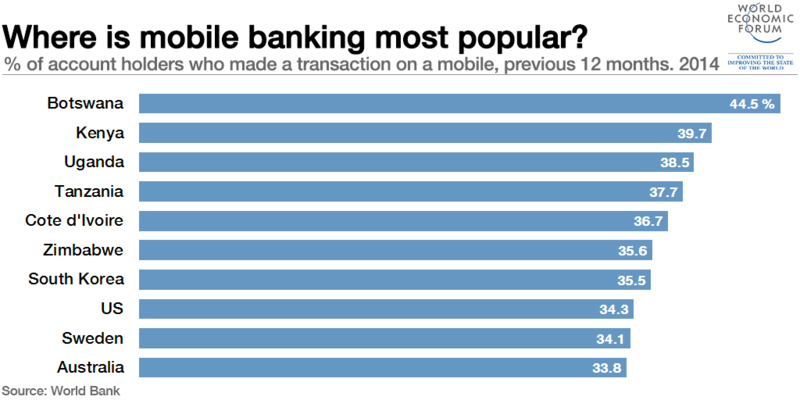 Where is mobile banking most popular? Data from the World Bank’s Global Financial Inclusion Database shows Botswana as the economy with the highest number of residents with a financial account who use mobile banking. Just under 45% of account holders in the southern African nation reported making a transaction using a mobile phone in the 12 months prior to the collection of the 2014 data. The following graph is based on this data, showing the percentage of financial account holders, aged 15 or older, who made a transaction using a mobile phone in the previous 12 months. Following Botswana in second place is Kenya, where 39.7% of account holders reported making a mobile transaction. Uganda comes in third, completing an African 1-2-3 at the top of the list – 38.5% of Ugandan account holders have made a transaction on a mobile. African nations dominate the top 10, taking the top six places. South Korea is the first non-African nation to feature on the list, with a score of 35.5%, while the US, Sweden and Australia complete the top 10. Image: A man browses the internet on his mobile phone at a beach. REUTERS/Feisal Omar.